The author's Skipjack Tuna caught on a surface iron jig in Baja, Mexico. Skipjack Tuna are found all over the world in warm waters. They can often be found feeding in large schools on the surface. Like all tuna, they are fast pelagic predators that swim around constantly looking for food. Unlike many species of tuna, they are not considered very good to eat. However, they are sporty to catch and make a great bait for other species. Many of my best catches ever were caught using Skipjack for bait. They can be used on a very wide variety of species. 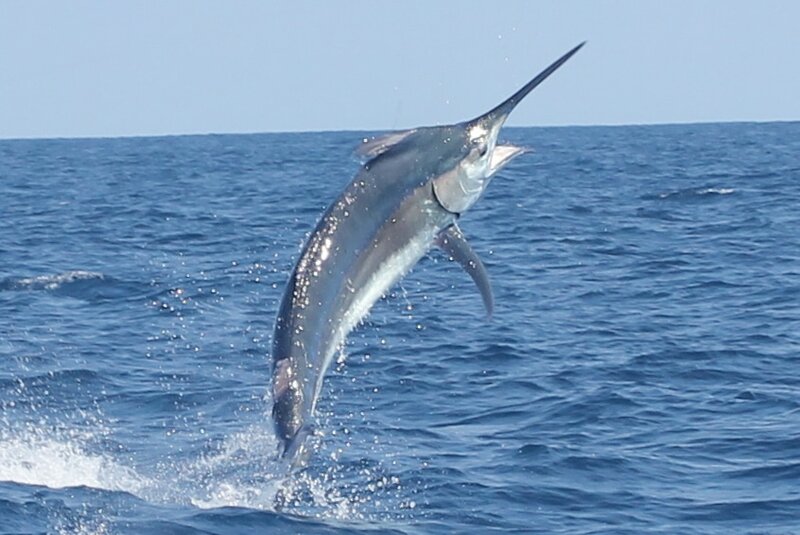 Skipjack can be bridled and fished as live bait for Marlin, Larger Tuna, and Sharks. They can be trolled as strip baits for Sailfish, Mahi-Mahi, and others. They can be cut into chunks and used as chum and hook bait for bottom fish such as Snapper and Grouper. See below for some pics of fish that were caught on Skipjack. Skipjack Tuna meat is very bloody and fishy tasting and few people consider it good eating. That bloody and oily quality is what make these fish such a good bait though. If you are actually targeting Skipjack Tuna for fun, they can be caught on relatively light tackle as long as you have a lot of line. They are very strong, like all tunas, but they live in open water and have nothing to wrap your line around. If you are patient and have enough line you could catch them on 2lb test line. However, most people who are trying to catch Skipjack are trying to get them for bait. In that instance, you want the heaviest tackle that they will bite so that you can get them in quickly, especially if you plan to use them as live bait. 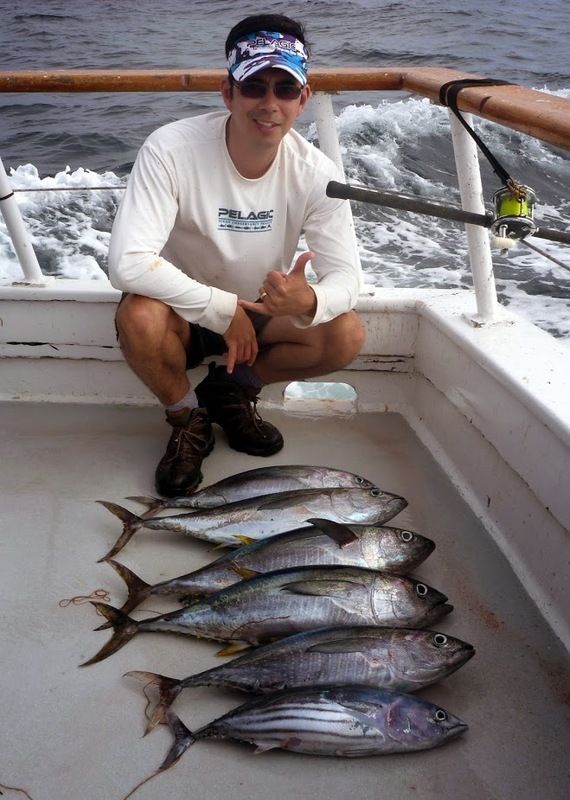 Most Skipjack Tuna are caught by trolling. However, they can also be caught casting lures or baits, especially if they are kept near the boat with chum. Often you can find the schools feeding on the surface; look for diving birds or other signs of life. Probably the best way to catch them is to troll small plastic skirts through the schools once they are located. You have to experiment with size and color until you find what works. Sometimes they are focused on very small baitfish and can be hard to tempt with a larger offering. Other times they hit everything you throw in the water. If trolling the small skirts doesn't work, you can try casting a shiny metal spoon and retrieving erratically. Skipjack will often hit trolled plugs and other lures meant for other fish, but usually that happens when you are not trying to catch them. If you are lucky enough to have live baitfish, the Skipjack will usually gobble them up. Anchovies or Sardines or whatever is in the area should work well. 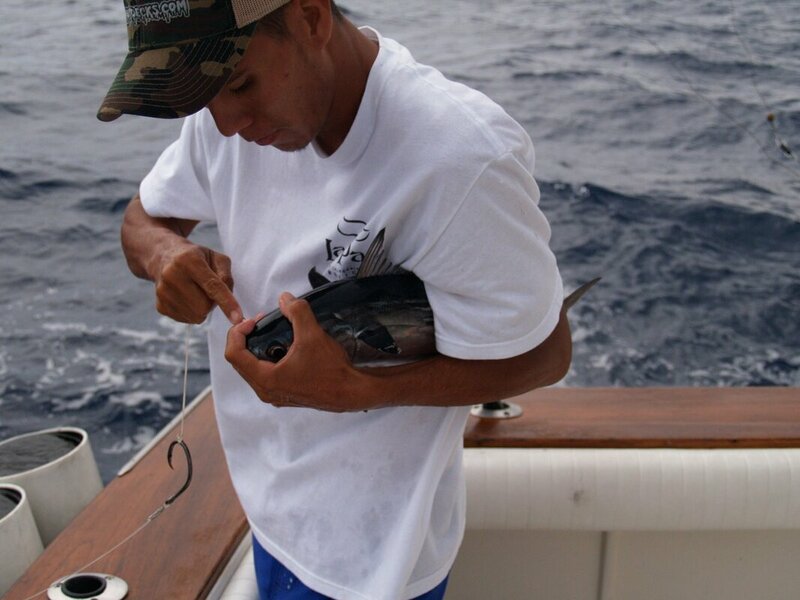 Bridling a Skipjack Tuna for bait to turn it into a Marlin. Skipjack can work for inshore fish too. The author's personal best Roosterfish shown above was caught on a live 5lb Skipjack. Skipjack tuna (bottom) are often mixed in with Yellowfin Tuna (top).